ST. LOUIS, Mo., March 21, 2017 – The St. Louis Cardinals and pitcher Adam Wainwright, in cooperation with Wainwright’s charitable organization, Big League Impact, announced today that the Official Cardinals Team Store at Busch Stadium will be the exclusive brick and mortar retailer of Adam’s recently launched “Waino’s World” t-shirt. The soft, stretchy, pre-shrunk shirt is being produced by St. Louis based baseball apparel company, 108 Stitches. Available for men and women, the comfortable, tri-blend (50% polyester, 25% cotton, 25% rayon) tee will retail for $36 at the Busch Stadium Team Store. For every shirt sold, 108 Stitches will donate a portion of the proceeds to Big League Impact and Cardinals Care. 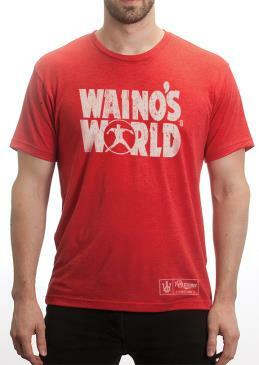 The club is encouraging fans to show their appreciation for Adam by wearing the “Waino’s World” shirt at Busch Stadium on days that he pitches. Wainwright has spent his entire 12-year major league career in St. Louis and ranks second among the Cardinals all-time strikeout leaders with 1487, trailing only Bob Gibson. A three-time All-Star, Adam enters the season tied with Dizzy Dean for sixth place in career wins for Cardinals pitchers (134) and last year combined with Yadier Molina to surpass Gibson and Tim McCarver for most career starts as Cardinals battery mates (217). Wainwright also ranks third among all active MLB pitchers in career ERA (3.17) behind only Clayton Kershaw and Felix Hernandez. The Official Cardinals Team Store at Busch Stadium is open seven days a week from 10 a.m. to 6 p.m. On Monday–Thursday game days, the store is closed to the public 30 minutes prior to game time. On Friday–Sunday game days, the store is open to the public up to 45 minutes after the game. Fans can order merchandise over the phone at 800-421-3263 and can also email STL_TeamStoreMailOrder@delawarenorth.com to order merchandise. Shop the Official Cardinals Team Store at Busch Stadium for officially licensed merchandise, apparel and gifts. The Team Store offers the largest variety of merchandise from the St. Louis Cardinals including official MLB licensed jerseys, t-shirts, outerwear, hats, one of kind collections and other apparel so you are completely outfitted for the game. With exclusive collections and special offers throughout the season, the Official Cardinals Team Store at Busch Stadium is the ultimate place to shop for the latest and greatest in Cardinals themed merchandise. Cardinals Care was established to give fans a way of teaming up with Cardinals players and the organization to help children in our community—both on and off the baseball field. Established in 1997, Cardinals Care has invested over $22 million to support St. Louis area children and built or renovated 22 youth ball fields in local under-resourced neighborhoods. Most recently, the Cardinals dedicated Adam Wainwright Field at Bob Russell Park in August 2016. This season will mark the 14th year of Cardinals Care’s innovative Redbird Rookies program, a free baseball league for kids who otherwise might not have the opportunity to play. In addition to providing all the uniforms, gloves, bats, balls and other equipment needed for each team, Redbird Rookies also provides extensive off-field support in the areas of health, education, mentoring and the cultural arts for each of the nearly 4,500 kids who participate in the program each year.